This post (now updated) first appeared at Greenz on November 18th, 2010 as I wandered about the city in search of fresh fruit and vegetables. A small market, Gyre finds itself calling one of the city's most fashionable areas home. Omotesando is, admittedly, not the first place one thinks of when shopping for fresh fruit and vegetables. Designer bags, watches, or glimpsing the latest fashion in action? Yes. Cauliflower, kaki, carrots and potatoes? Maybe not. Yet, fashionable locavores can find the season's top sellers of the edible and fresh variety rather easily. The Gyre Market - the seed, if you will, of the considerably larger UN University Market - is tiny and enticing. Opened just three years ago and recently remodeled, the shop keeps with its surrounds by being mildly boutique-y. Plain wooden "box" shelving gives a rustic feel reminiscent of the kinds of fruit and vegetable stores disappearing from the produce landscape. 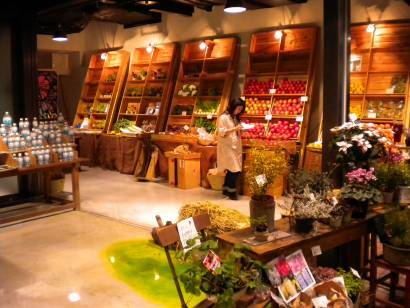 Track lighting literally spotlights the carefully arranged sampling of bounty sourced from organic and conventional growers all over Japan while shoppers tap their toes to the trendy beats of the day's music selection. On this visit, the season was clearly in full swing. Eye-catching kaki (persimmon) quite rightly fronted the display in all their orange brilliance, while sweet potatoes and tall thin gobo (burdock root) sported dusky maroon and brown jackets, respectively. Winter squash in varying shades of green reminiscent of long summer days sat next to golden onions, and tawny potatoes as verdant winter greens lingered nearby. Brazen white cauliflower and kabu (a Japanese turnip) filled the upper shelves, while red and gold apples sat sweetly (literally and figuratively) next to the kaki. 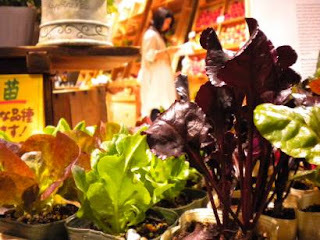 Busy arranging the display and talking with customers, Katayama san of Shukubutsu Freak (Plant Freak), offered tiny cactus, richly colored swiss chard and beets, purple karashina, oregano, parsley, chives, along with flowers and spring bulbs. Although not an organic grower, she does sell bags of homemade potting soil that looked wonderfully plant-a-licious. The Gyre Market, like Shinonome, is small, but worth a trip. Positioned between the Earth Day Market in Yoyogi Park and the UN University Market in Aoyama, it could be a nice warm-up for some good food shopping. *Below Bulgari and next to Snoopy Land. Any idea if any of these have rhubarb? Going to try the Farmer’s Market @ GYRE either way. I don't know if they do. I've never seen it at a farmers market here, but it doesn't mean it isn't there. That said, I have plenty in my garden. Give me a shout and we'll work something out before I turn it all into jam.